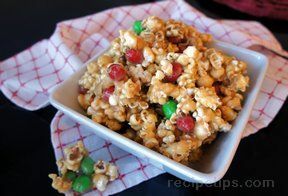 Your favorite bars made into a simple popcorn snack. Can it get any better? Kids and adults will love this irresistable treat. Use seasonal M&Ms for the holiday spirit. Boil corn syrup and sugar until clear. Remove from heat. 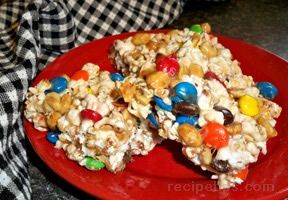 Add peanut butter and pour over popcorn and M&Ms. Stir. 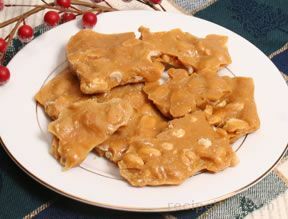 You can spread out on cookie sheets or waxed paper if you want it in small chunks. 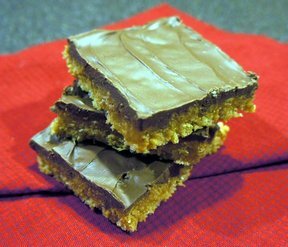 NOTE: The same recipe can be poured over 6-7 cups Rice Krispies and topped with melted chocolate chips and peanut butter.